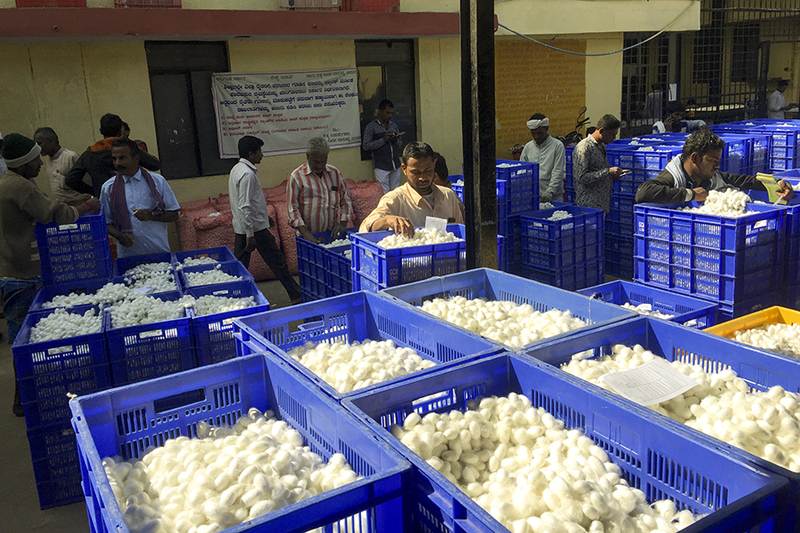 Silk farmers at Ramanagara, Karnataka are unable to fetch desirable prices for their cocoons. They have been demanding an organised market to sell their raw silk. The silk industry in Karnataka has been facing a lot of issues, including lack of technology and rise in import of raw silk from China. Exports have declined by 15-18 percent each year in the past five years. Besides there is a major decline in the demand and price of cocoons due to the availability of higher quality raw silk from China. As a result, the number of silk reelers has reduced from 14,000 to 6,540. Import duties on Chinese raw silk stand at 11 percent, and the landed cost works out to ₹4,800 per kg. Local raw silk is available for ₹4,600 per kg. The price of raw silk in India depends on the selling price of Chinese silk and it varies accordingly. Silk farmers and reelers have been asking the government to reduce the import of raw silk from China. In Budget 2019 on Friday, Finance Minister Piyush Goyal said poor land holders need structured income support. Therefore, a scheme called PM Kisan Samman Nidhi was announced, under which farmers owning up to 2 hectares will get ₹6,000 per year. The money will be transferred directly to their accounts in three tranches. The package will cost the government ₹75,000 crore. But farmers in Karnataka are not satisfied. “It is a great move by the government and we appreciate it, but that is not going to reduce our problems. Previously, we used to get ₹500 per kg for our cocoons which has come down to ₹300 per kg; their demand has gone down due to the import of raw silk from China. We want the government to its import from China… that will really help us,” says Shivanand Kere, a farmer from Tumkur, Karnataka. Silk farmers wants the government to look at the larger picture and bigger issues concerning them.